The page dedicated to Homer, Homer, and more Homer. Please send in all the homer stuff you can get! 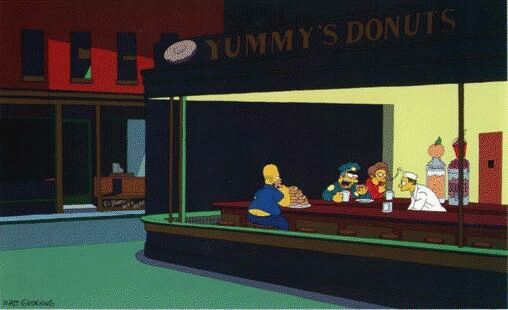 As safety inspector in sector 7G at the Springfield Nuclear Power Plant, Homer's main responsibilities include Snack Machine Monitoring, Clock Watching, Inner-Eyelid Study and Pastry Malfunction Prevention. As doting father for his family, Homer's main responsibilities include Couch Patrol, Underwear Distribution and Carpet Debris Production. A devoted husband, Homer leaves his wife with few complaints. When pressed however, Marge did once acknowledge to a marriage counselor that Homer "forgets birthdays, anniversaries, holidays (both religious and secular), chews with his mouth open, hangs out at a seedy bar with bums and lowlifes, blows his nose in the towels and puts them back in the middle, and scratches himself with his keys." Despite these few foibles, Homer loves his family, and he'll do just about anything to prove it -- even if that means making himself look foolish. Homer works at Springfield's nuclear power plant as a safety inspector, a job he secured after passing the specialized training course on his third attempt. Once during a strike, Homer's critical functions could be filled only by a brick placed on a lever. Homer was also voted Springfield Nuclear Power Plant Toxic Waste Handler of the Month in October of 1990. Homer's favorite book and/or pamphlet is "So, You've Decided to Steal Cable," which also happens to be the most recent book and/or pamphlet he has read. 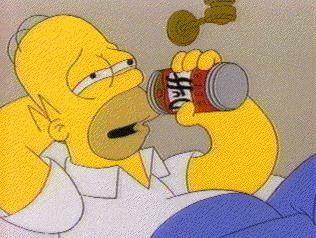 When he's not reading, Homer enjoys drinking beer, at home or in a bar. His favorite haunts include Moe's Tavern, Greasy Joe's Bar-B-Q Pit, Gulp 'N' Blow, and The Frying Dutchman, which he almost put out of business on its "All You Can Eat Night." Since then, Homer's picture has hung in the restaurant, where he's known as "Bottomless Pete: Nature's Cruelest Mistake." "But I'm So Sweet And Tasty!"